An electric air pump is a valuable utility even if it will not be used very often. Regardless of the purpose of the pump, as long as it is not used commercially, it will not be used all that often but when the time comes, having it around will help a lot. Inflating something like an air mattress without a pump will prove to be a nightmare. Also, putting more pressure into the tires of a car is the kind of job that only an electric air pump can handle. These two examples show how electric pumps can help a lot in various situations but they also show that there are different types of pumps. Getting the right type of pump is important but it is equally important to avoid spending money on a poor quality product. An electric pump is much heavier than a manual one but they can inflate items much faster and more efficient depending on how powerful it is. Even if an electric pump is more expensive than a manual one, it gets the job done faster and it is much more convenient to use as long as there is a power outlet close by. There are models that are battery powered but they are less reliable as the motor is smaller and their airflow output is inferior. Most electric pumps come with various extensions that give them a bit of versatility when it comes to purpose. The nozzle will determine what it works and most models have several included. What is an important aspect is the air flow output and motor power? For our list, we picked 10 different models that have been selling well for obvious reasons. Without delaying it any further here is our recommended list of the top 10 best electric air pumps in 2019. Intex Quick-Fill is a cheap little pump that was made for outdoors and indoor use. The kit comes with the small pump and a wall adapter. Additionally, the pump can also be powered using the lighter socket in a car since it includes an adapter for that as well. The pump itself comes with 3 different nozzles that should fit most valves. It can be used for airbeds and other large inflatables as it has a decent airflow. A useful feature is the fact that it has reverse airflow which means it can be used to deflate items as well. 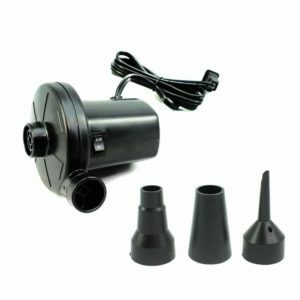 Swimline electric pump is an inexpensive and efficient machine. According to the manufacturers, it is a high capacity electric pump with a large electric motor that was designed mostly for inflatables such as an airbed or tubes. The pump comes with a long power cord and comes with 3 different nozzles. It has a small handle at the top to make it easy to carry. Besides inflating, the pump can also use to deflate by plugging the tube into the other outlet which pulls air in. Smart Air Beds electrical air pump is one of the cheaper options for the ones that know they will not need it all that often. It has an airflow of 450 L/min and works quite well with inflatable items. The pump can also be used to deflate and comes with 3 nozzles. It is a wall plug powered model and uses a small but powerful electric motor. All it takes is to switch the on button and plug the nozzle into the appropriate hole. The pump can also be used to deflate by connecting the nozzle in the hole that pulls air in. Intex Quick-Fill electric air pump is a cheap pick that works quite well. The pump uses a small electric motor with a thermos protector built-in which makes it much safer to use and less likely to break down. It comes with 3 nozzles that are easy to connect and comes with a small carry handle. The pump is quite lightweight and very straightforward to use. It just needs to be plugged into a wall plug and switched on. The pump has a second outlet that can be used to connect the hose and deflate items. 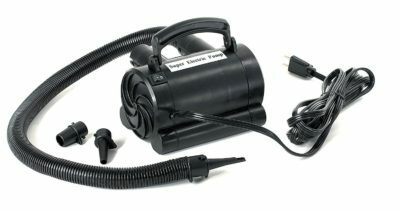 Smart Air Beds electrical airbed pump is a great little machine that will work with most inflatable items. It comes with a complete kit that includes the pump itself and 3 different nozzles that are very easy to swap. The pump is powered by a regular wall socket and has a decent cord length. Like most other pumps, it has two outlets that can be used to inflate or deflate items. It can work with most types of inflatable items as long as they have a compatible nozzle. 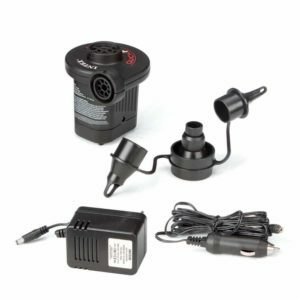 The Kwik Tek electric air pump is a bit different from the rest of the models on our list. It is larger, uses a more powerful motor and has a more reliable construction. The unit comes with a long power cord, a carrying handle and 3 easy to swap nozzles. The air intake and exhaust have the same size meaning that the hose can be attached to inflate or deflate. Airflow is quite decent which means that it can inflate an airbed faster than the smaller electric air pumps. The hose is quite short when compared with what other pumps use. It is still better than a pump that does not have one at all. It if would have had a longer hose, the pump would have scored higher on our list. The Coleman QuickPump was designed to be portable and easy to use. 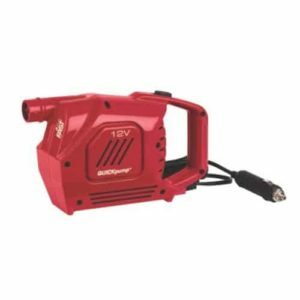 It is a small pump that is powered by a 12-volt car lighter socket. The pump has a small handle and just an on and off switch. The kit does not contain a hose but this should not be a major issue since it is lightweight and quite compact. As for nozzles, like most other pumps it has 3 in the kit that is very easy to swap. It can also be used to inflate or deflate items by using the air intake or exhaust. Usually, having a short power cord is not such a big issue because there are power cord extenders. The problem is that the pump works with the car lighter socket which means that there are no power cord extenders. 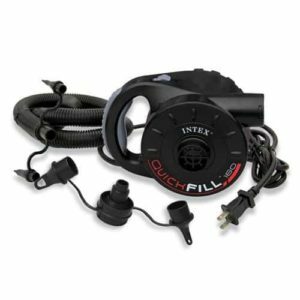 Intex Quick-Fill electric air pump is fairly similar to some of the other offerings on our list. 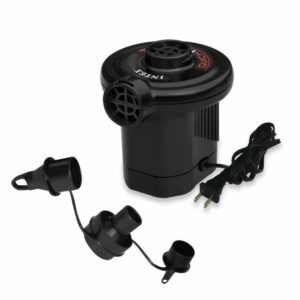 It is a compact pump powered by a small electric motor which makes up for a decent airflow. The unit has an air intake and exhaust that can be used to inflate or deflate and has 3 different nozzles that are very easy to swap. It was designed mostly for airbeds and rafts but it can work with any inflatable item as long as the nozzle fits. As with most other pumps, it is powered by a regular 110-120 volt power outlet. The pump has the same issue as most other models on our list and that is the absence of a hose. There is no option to buy one separately which is a shame. However, being small and compact makes it easy to use even if it does not have a hose. 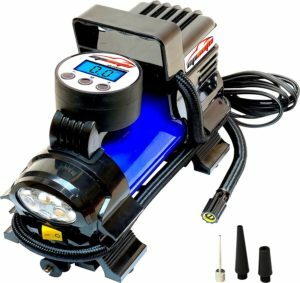 EPAuto portable air compressor pump is by far the most powerful model on our list. It can be used to inflate almost anything from airbeds to car tires. This is due to the powerful electric motor used. The model has a pressure gauge and a small LED lamp. To power the pump, the unit needs to be plugged into a car lighter socket. Inside the kit, 3 different nozzles have been provided and a small carry bag. Last but not least, the pump has the capability of having the pressure set and stopping automatically when it is reached. The pump is a bit slow when it comes to inflating something like a tire. This is because the motor used is not very powerful but good enough. Fortunately, it is also not as noisy as some of the other electric pumps on our list. 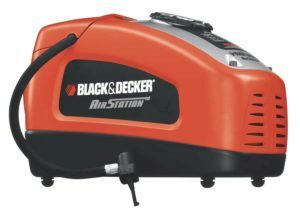 Black & Decker ASI300 it a great pick for the ones that are looking for a reliable pump that will not break down easily. The model can inflate anything from an airbed to a bike or car tire. It is quite large but it is also much more powerful than other pumps. The unit is powered by a regular 110-120 volt power outlet and has a reasonably long cord. As for features the pump also allows the user to set a pressure and the pump will stop when that pressure is reached. The pressure gauge is a nice addition but there is a problem with it. Many have noticed that the pressure gauge is a bit off or inaccurate. The difference between the pressure on the indicator and the real pressure is not that big but it is something to take into account. 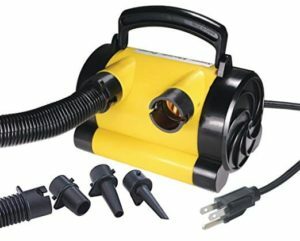 With or without a hose: Electric air pumps that come with a hose are a bit easier to work with but they take more storage space and this tends to matter for some. Noise: Some pumps tend to be much noisier than others. This is because of the air intake and exhaust. It can be different from one pump to another. Nozzles: The vast majority of pumps have several different nozzles included in the kit but this is not a general rule. It is possible for some models to have just one nozzle that is not detachable.